As the cries to “get tough” on Seattle’s sprawling homeless camps grow louder, lost in the din is a court ruling Monday that said: Sorry. Not going to be that simple. It seemed everyone was either too busy howling or defending the status quo to notice it. 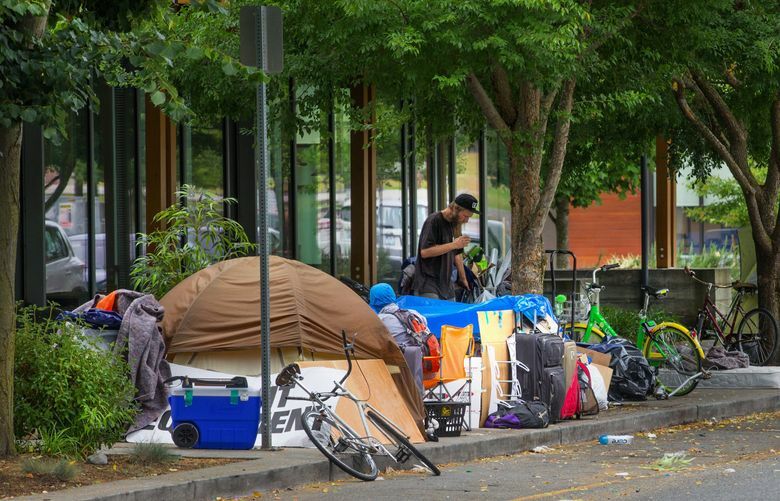 Even if cities like Seattle were to try to broadly enforce no trespassing laws to clear out all those people living in greenbelts and under bridges, it could be unconstitutional, the Ninth Circuit Court of Appeals found. In an “en banc” ruling — meaning all 23 judges were eligible to vote — the judges found that lying down to sleep is so fundamental and life-sustaining that cities can’t bar people from doing it on public property, unless there’s somewhere else provided, indoors, for the people to go. “The court said that people experiencing homelessness cannot be punished for sleeping or sheltering on the streets in the absence of alternatives,” one advocacy group that brought the Idaho case summed up Monday. The group noted it applies to all the Western states in the circuit, which includes Washington. On the core human point — that everybody needs to lie down to sleep — the judicial majority is unquestionably right. Sleep is as basic to human survival as breathing. But some of the judges dissented on more practical grounds. And their descriptions of the box this puts cities in sure sounded familiar. That the judge predicted lax enforcement of no trespassing laws is just the start. Cities will find they also can’t uphold health standards against public pooping and peeing, or open drug use. “The use of hypodermic needles and the like is no less involuntary for the homeless suffering from the scourge of addiction than is their sleeping in public,” the judge wrote. Yep, that all resembles us. Both the squalor and the paralysis about how to help. I’ve argued in this space for years that leaving these Third World conditions in place is the cruelest possible choice. Yet because building housing is time-consuming and expensive, that’s pretty much what we’ve done. So I’ll argue again — futilely I’m sure — that it’s way past time to treat this like a real emergency, as if we’d been hit by a hurricane or earthquake. Or a perfect storm of gentrification and addiction. In response, we should put up giant FEMA-like tents, perhaps down at the vacant Terminal 5 at the Port of Seattle. Then sweep the encampments, and say: You can’t stay here, under this bridge. But you can stay over there, in that giant, managed tent barracks, complete with supportive services. This would be far more humane than the shantytown tragedy we have now. It would satisfy the court, as there would be places for people to sleep (this would be true whether the homeless accept the shelter or not). And it could help clean up Seattle while the city’s admirable, longer-term housing efforts continue. The current debate dividing Seattle — “they’re drug addicts who need enforcement” versus “they’re people who deserve compassion” — seems pointless in light of this court decision. The court said it doesn’t matter who they are, what problems they have or how to fix them. What the city must provide first, as a baseline, is places to sleep. So at long last, now in year four of the emergency, can we at least get on with doing that? A personal note: When the newspaper runs notices that I’m “taking the day off,” readers often wonder what’s going on (some wonder this with great hostility). So this is a heads-up I’ll be absent more than usual. That’s because my mom, Helen, had a massive stroke, and I’ll be out of Seattle to visit her in the hospital and sit with my dad. My mom’s quiet skepticism is what put the newspaper ink in my veins. But what I most need to be now, for her, is the opposite of skeptical. Not my strong suit, but in the meantime it’s a heck of a situation to sum up as “taking the day off.” For some reason, it helps that now you know. Danny Westneat: dwestneat@seattletimes.com; Danny Westneat takes an opinionated look at the Puget Sound region's news, people and politics.